Judge rules to stop the roundup and forced drugging of beloved Nevada herd (NEVADA)-U.S. District Judge Larry Hicks has granted Friends of Animals' and Protect Mustangs' a motion for a preliminary injunction to stop the Bureau of Land Management's round-up and permanent removal of 200 wild horses in the Pine Nut Herd Management Area (HMA) and the round-up of another 132 wild horses so that an estimated 66 mares can be given the fertility control drug PZP. Hicks said that with the proposed Pine Nut roundup, which was slated to begin Feb. 20, 2015, the BLM has failed to satisfy the National Environmental Protection Act and other federal laws that are applicable. "Accordingly, the court finds that the public interest will be best served by enjoining the BLM's proposed gather, at least until the court has an opportunity to fully consider the merits of plaintiffs' claims," Hicks said. 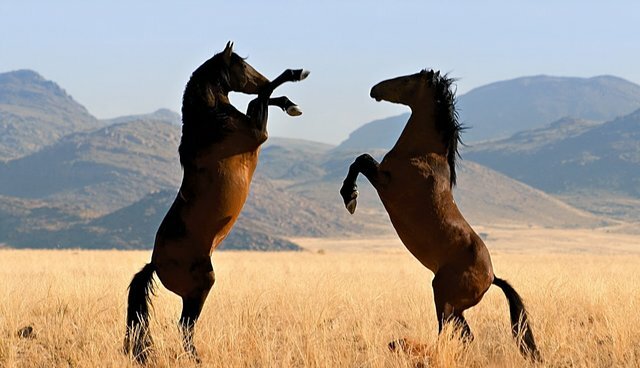 "We are delighted that the Court agreed with Friends of Animals and Protect Mustangs that BLM is obligated to fully evaluate under NEPA each and every proposed round-up," said Michael Harris, director of Friends of Animals' (FoA's) Wildlife Law Program. "In relying upon a stale Environmental Assessment from 2010, BLM has not met its duty to fully inform the public about the impacts associated with its plan to permanently remove more than 200 wild horses from the Pine Nut Range, and to dose dozens of mares with the fertility drug PZP. It is time for BLM to evaluate the harsh reality that PZP has long-term detrimental effects on wild horses." "I would say this is a major victory for wild horses and reflects rising concerns about rounding up and drugging wild horses with PZP," added Jennifer Barnes, staff attorney with FoA's Wildlife Law Program. "Today is a milestone for America's wild horses who have been scapegoated for range damage and forcibly drugged with PZP in experiments for decades," says Anne Novak, executive director of Protect Mustangs, "They should never live in zoo-like settings on public land. That's not freedom. Wild horses are a native species who contribute to the ecosystem. They belong here." "I'm grateful that the wild herd I've been studying for 50 years has received justice in federal court today." Craig Downer, director of ecology and conservation at Protect Mustangs. "This is an opportunity to restore the herds."